On September 1, 2015, the Tokyo Organizing Committee for the Tokyo 2020 Summer Olympic Games pulled their official logos after accusations arose that the designs were plagiarized. Japanese designer Kenjiro Sano was accused of plagiarizing the designs that are similar to a logo created by Olivier Debie for the Liege Theatre in eastern Belgium. Initially the Olympic Committee defended Sano’s designs after they were unveiled in July 2015, but later caved to public pressure as criticism mounted. 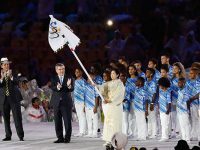 On August 28, Toshiro Muto, CEO of the Tokyo 2020 Summer Olympics, said that the designs were original; however, they were scrapped soon after as Sano issued an apology on his website. Sano insisted he never copied or plagiarized the design. According to the designer, he pushed to have them removed them to protect his family and staff stating that the controversy has made him reach a limit of public shaming that he can no longer endure. There is no new logo for the 2020 Tokyo Summer Olympics yet and the organizing committee is thinking about opening a competition to find one. There is a lot of support for one particular design that was posted on Twitter by a Japanese resident of Spain, which you can see below. This isn’t the first hurdle that the 2020 Tokyo Summer Olympics has had to jump over. In late August, the committee had to cancel the construction plans for the New National Stadium due to budgetary constraints. Organizers are now working on finding a new design that will help them build a main stadium that will fit into their budget.